Acupuncture is an important technique of traditional Chinese medicine for the prevention and cure of diseases, and the promotion of bodily health. However until now there has never been a book specially introducing to foreigners where the acupoints are actually located under the skin, how deep they are and in what direction they go. The Atlas of Layered Anatomy of Acupoints introduces the distribution, direction and depth of more than 300 acupoints on the human body Liver by layer, from the skill, muscles, blood vessels, nerves and skeleton to the viscera. 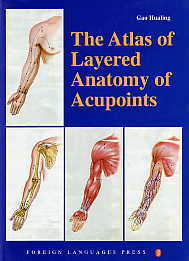 This book also includes the names of the acupoints, the main diseases treatable it each acupoint, basic knowledge of acupuncture, and the precautions to he taken when locating points and applying acupuncture techniques. Hence it Is an ideal reference book for medical workers and others interested in acupuncture.